One of the best ways to enjoy your cannabis, homemade cannabis-infused banana muffins are easy, straightforward, healthy(ish) and, of course, great tasting! Here is how you can make your own. We know cannabis is an epic plant. You can wear it, use it to run your car, use its seeds as a nutritional food source, and of course, smoke and ingest its flowers for both fun and therapeutic pursuits. One of the most fun things to do with it is cook, so we have put together a recipe for 12 primo banana muffins – ideal for getting you through the day! Cannabis bud smells fantastic - drool worthy in fact. Though it might smell like candy apples and maple syrup or lemon, lime and pomegranate, it really isn’t great to eat raw. However, cooking makes for better meds and much better flavour – especially when in a sweet, succulent muffin! Y'know that recipe of legend that was passed down through generations? This is one of those recipes. A healthy delight that can get you really grooving in your day if you have one for breakfast. In order to make your muffins, you will need a cannabis-infused oil. We have recipes for both olive and coconut-oil. The olive oil will be much subtler, while the coconut will add a nice exotic twist to the muffins. 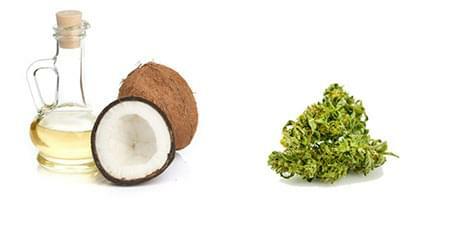 If you don’t want to make oil, you can simply use decarboxylated cannabis – trim and shake are best for this purpose. This is the process of heating your cannabis to activate the compounds within – such as the much-loved THC. To do so, spread your cannabis over a baking tray and cook it in the oven at 120°C for 27 minutes. If you choose to do this, you can check out how to incorporate it into the recipe at the end. This cannabis-infused banana recipe produces 12 servings. Prep time 15 minutes. Cook time 15 minutes. 1. Preheat your oven to 180°C. Grease your muffin tray. 2. In the big bowl combine the flour, bicarbonate of soda and sugar until evenly mixed, and make a well in the centre. 3. In the medium bowl whisk together the mashed banana, oil, egg and milk. 4. Pour the banana mix into the well in the large bowl and gently stir together until combined. 5. Spoon the mixture evenly into the greased holes of your muffin tray. 6. Bake in the oven for fifteen minutes or until a skewer gently inserted into the centre comes away clean. Remove from the oven when cooked and set aside to cool. There's no real rule to cool; you can enjoy them in a bowl with ice cream while they are still hot rocks! 7. Using the electric mixer beat the cream cheese, rind of your choice and icing sugar until it is light and fluffy. 8. Spread each muffin top with a little of the mixture. To make this same recipe with dried and powdered decarboxylated green matter, you will need to tweak the moisture content a bit to allow for the extra dryness. 1. To do so, make the above recipe, remember what the texture looks like: it should be thick and doughy. 2. Add one cup powdered greenery, an extra half a teaspoon of the bicarbonate and an extra egg. 3.Remembering the original mixture compare to what you have now. 4. Still a bit thick? Slowly add milk until you are in the Goldilocks zone, just right. Remember, cannabis edibles can take anywhere between 45-120 minutes to kick in, so don’t overdo it! Consume responsibly, enjoy the buzz, and make sure anyone else who takes a bit knows what’s in it! Happy cooking!